Executive Summary: It's February 28 again, i.e., "2/28." Time for the Taiwan independence Quislings' Annual 228 Taiwan Independence Lie-athon, during which they conduct Marathon sessions repeating all sorts of lies about the tragic 228 Incident of 1947. In keeping with this time-honored tradition, a March 01, 2005 editorial in the pro-independence Taipei Times entitled "The Sobering Lesson of 228" told one Little Lie and one Big Lie. The Little Lie was: "Last year's 228 Hand-in-Hand Rally, which protested China's military posturing, was a milestone in Taiwan's political history. From one end of the island to the other, 2 million people formed a human chain in an affirmation of peace and democracy." The Big Lie was: "The wholesale slaughter -- both arbitrary and strategic -- of tens of thousands of civilians and intellectuals by the Chinese Nationalist Party's (KMT) armed forces ended an all-too-brief period in which Taiwanese freely believed that rule by "China" would be benevolent and enlightened." The Little Lie: "Last year's 228 Hand-in-Hand Rally, which protested China's military posturing, was a milestone in Taiwan's political history. From one end of the island to the other, 2 million people formed a human chain in an affirmation of peace and democracy." The Truth: The Taipei Times' claim that two million people participated in their human chain is a Little Lie. Actually, it's a pretty big lie, but we are speaking in relative terms here. The claim is nothing less than a physical impossibility. Don't take my word for it. Do the math for yourself. 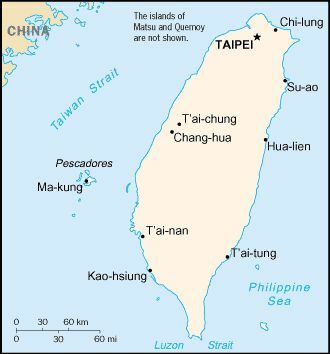 As the CIA World Factbook map of Taiwan shows, the offshore Chinese island of Taiwan is 390 kilometers long, as the crow flies. Three hundred and ninety kilometers is 390,000 meters. A human chain consisting of people spaced one meter apart stretching the entire length of Taiwan, from Keelung in the north to Kenting in the south would be only 390,000 people long. Even allowing for the fact that the human chain followed winding roadways rather than a straight line, it could not have been more than 500 kilometers long or 500,000 people strong. A human chain two million people strong would stretch the full length of Taiwan not once, but four times. A human chain two million strong and 500 kilometers long would have to be four people wide for its entire length. It would have to be four people wide not just along part of the human chain, but four people wide along the entire length of the human chain. Did the 2004 "228 Hand in Hand Rally" human chain stretch the full length of Taiwan four times? It did not. It failed to stretch the full length of Taiwan even once. 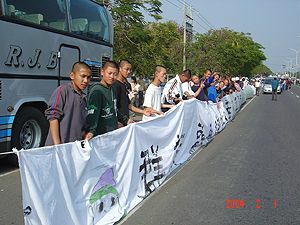 Was the 2004 "228 Hand in Hand Rally" human chain four people wide for the full length of Taiwan? It was not. Not only was it not four people wide for the full length of the island, it was totally umanned for long stretches in remote parts of the Taiwan countryside due to a combination of indifference and antipathy toward flagrant Pan Green populist manipulation. Photographs posted at the Pan Green camp's own websites reveal that even in the major metropolitan areas, where mobilizing supporters was relatively easy, the human chain was often only two to three people wide. By the time the chain reached the suburbs, it thinned out to only one person wide. By the time the chain reached the remote countryside, it often disappeared altogether. The Taipei Times' editorial was, as usual, "at variance with the facts." Left: The "228 Hand in Hand Rally" in the Metropolitian Area. 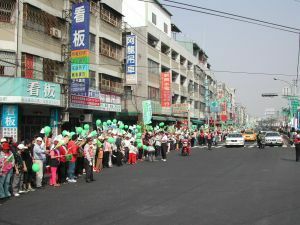 Right: The "228 Hand in Hand Rally" in the Suburb. The Big Lie: "The wholesale slaughter -- both arbitrary and strategic -- of tens of thousands of civilians and intellectuals by the Chinese Nationalist Party's (KMT) armed forces ended an all-too-brief period in which Taiwanese freely believed that rule by "China" would be benevolent and enlightened." The Truth: The government's own official records show that the total number of victims, including killed, missing, incarcerated, and defamed, add up to only 1,300. The total number of dead add up to no more than 900 (857 to be exact). The Taipei Times' claim that KMT troops killed "tens of thousands of civilians and intellectuals" is one of the Taiwan independence movement's biggest lies, one that has been disseminated far and wide over the internet by Taiwan independence true believers and fellow travelers. And as Nazi Party Propaganda Minister Joseph Goebbels noted, a lie repeated often enough will eventually be accepted as the truth. "In 1995, families of those killed or missing as a result of the February 28 Incident became eligible for compensation of NT$6 million, in accordance with the "Regulation on Compensation and Administration of the 229 Incident. "People incarcerated for over 20 years because of the incident may receive NT$5 million. Others who have suffered or whose reputations have been harmed are also eligible for reparation. The government has approved compensation for 1,300 victims." There you have it, straight from the horse's mouth. After a full decade of processing claims under two consecutive pro-independence administrations, a grand total of 1,300 victims. Fewer than 900 dead. Now 900 dead is 900 too many. But that being the case, why do Taiwan independence propagandists feel compelled to inflate the number to "tens of thousands?" To ten, twenty, even thirty thousand? Is the official figure of 900 dead not provocative enough for Pan Green propaganda purposes? Must the number be exaggerated by not one but two orders of magnitude to achieve the political impact these demagogues desire? Bear in mind that the 1,300 figure consists overwhelmingly of "native Taiwanese" victims. It does not include "mainlander" victims without surviving kin to file claims on their behalf after their deaths. An incalculable number of mainlanders were slaughtered by rampaging mobs egged on by Taiwan independence provocateurs and Japanese Fifth Columnists before government troops arrived by troop ship in early March. Some historians who have investigated the 228 Incident suspect that nameless, faceless mainlander victims may account for part of the discrepancy between the number of official victims and the number of estimated victims. If that is the case, many times more "mainlanders" than "native Taiwanese" were murdered. If that is the case, then for Taiwan independence Quislings to trot out the 228 Incident regularly as clockwork to justify charges of "Mainlander Original Sin" and hatred of "Chinese" is insult added to injury. The Taipei Times' editorial pontificates about "sobering lessons" learned from the 228 Incident. One sobering lesson we have learned from the Taipei Times' Little Lie and Big Lie is that Taiwan independence Quislings are chronic and habitual liars. Fortunately for patriotic citizens of the Republic of China, Taiwan independence Quislings are too intellectually indolent to fabricate a Little Lie that can't be rebutted with a few simple math calculations, or a Big Lie that can't be rebutted by a 0.08 second Google search on the Internet.